What is the Agile Scrum Framework and How Does It Work For Marketers? Get the complete guide in one easy-to-read format! 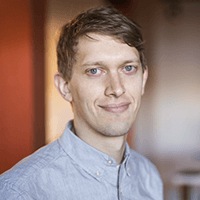 Ben Sailer is the Content Marketing Lead at CoSchedule. His specialities include content strategy, copywriting, and SEO. Marketing departments are often chaotic places where keeping organized, communicating clearly, and hitting deadlines sometimes feel like pipe dreams. Last-minute projects derail priorities, meetings that should have been emails (or even just a Slack message) take you off task, and late nights at the office are all part and parcel with the job. It all adds up to project delays and wasted money for often substandard work. Those three things together do not add up to a productive workplace or a satisfying career, either. Marketers aren’t the first folks on the planet to face these issues though. Nor were they the first to devise a better way of managing projects and shipping work on time. In fact, one of the best solutions to these problems (and more) has its roots in software development (and before that, auto manufacturing). 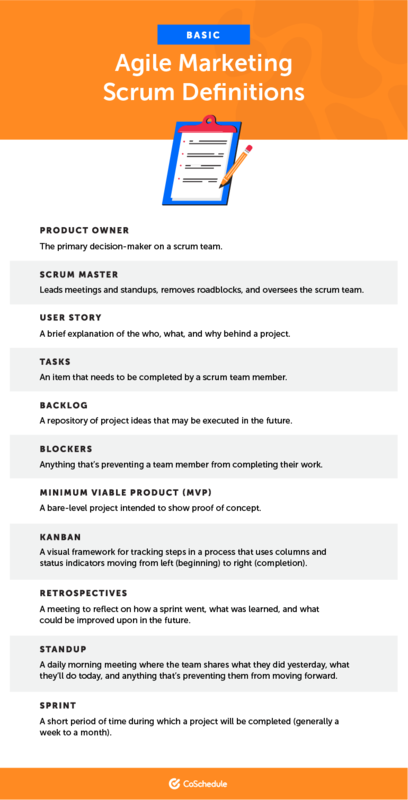 It’s called scrum, and this chapter is all about how it works. The less athletic of those amongst us can breathe a sigh of relief. Getting down to business, Scrum is an agile framework for managing projects from start to finish. It’s based around the values of self-organizing teams iterating rapidly on collaborative plans. 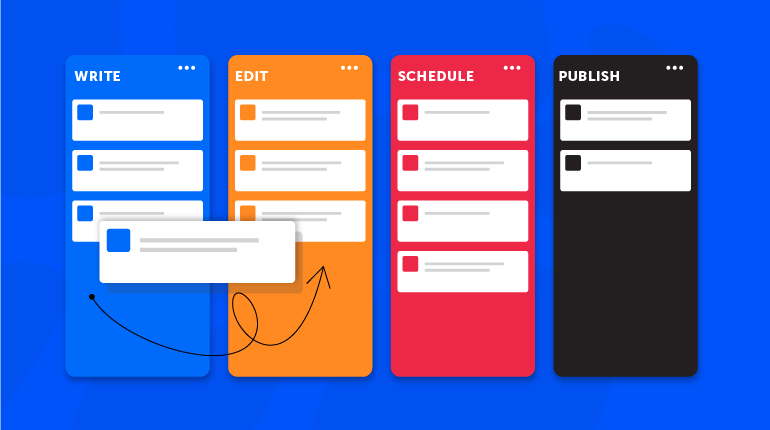 In short, it’s intended to remove as much waste and red tape from workflows as possible, so everyone’s effort can be focused on doing the most important task at each step of a process. Who Came Up With All This Stuff, Anyway? There’s a little bit of debate around who exactly devised the scrum framework and who coined the term “scrum” itself. However, it’s commonly accepted that it first appeared in the Harvard Business Review in a 1986 article titled “The New New Product Development Game” by Ikujiro Nonaka and Hirotaka Takeuchi. It was later documented in deeper detail by Jeff McKenna, Jeff Sutherland, and John Scumniotales. What matters most is that several smart people devised and refined the framework to develop a better way of getting products built and shipped. For marketers, rather than thinking about products or software, we instead focus on projects and campaigns. Scrum doesn’t necessarily need to be executed just one way, either. In fact, there are several different variations out there, and it’s adaptable to the needs of the organization putting it into place. One such variation is called scrumban, which is a combination of scrum and kanban. It brings together the structural elements of scrum with the visual components of kanban. The process described in this guide is closer to scrumban than a pure scrum framework. This is not to suggest that one approach is better than another, but it is one that can work well for marketing teams. For a more in-depth exploration of scrum and its application, it’s worth downloading the official guide. You can read the entire thing online or download a PDF (in over 30 languages, no less). There may be more information there than you need to get started with your marketing team, but it remains worthwhile reading. This guide has already thrown a few terms around that you might not have known before. So, before moving much deeper into the world of agile, it’d be helpful to explain some basic terminology and methodologies you’ll be likely to encounter. It can seem complicated at first, but the general concepts behind it are simple enough to easily understand the basics. Product Owner: The primary decision-maker on a scrum team. Scrum Master: Leads meetings and standups, removes roadblocks, and oversees the scrum team. User Story: A brief explanation of the who, what, and why behind a project. Tasks: An item that needs to be completed by a scrum team member. Backlog: A repository of project ideas that may be executed in the future. Sprint: A short period of time during which a project will be completed (generally a week to a month). Standup: A daily morning meeting where the team shares what they did yesterday, what they’ll do today, and anything that’s preventing them from moving forward. Retrospectives: A meeting to reflect on how a sprint went, what was learned, and what could be improved upon in the future. Blockers: Anything that’s preventing a team member from completing their work. Minimum Viable Product (MVP): A bare-level project intended to show proof of concept. Kanban: A visual framework for tracking steps in a process that uses columns and status indicators moving from left (beginning) to right (completion). How Are Scrum Teams Organized? Scrum is all about getting teams to work well together to get projects done efficiently and on time. In order to achieve this goal, they need to be structured in a way that facilitates proper implementation. The Product Owner establishes what’s needed for completion. As stated before, this is the central decision-maker on the team. The scrum master manages the process day-to-day. This entails removing blockers, running standups and retrospectives, and ensuring the team has what it needs to get its work done. Each team member takes care of their own work. 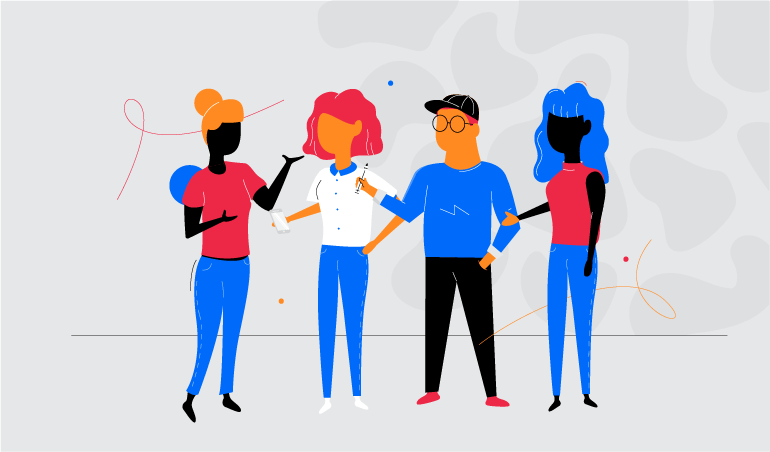 Rather than having a boss breathe down their neck, standups and ongoing communication between team members keep everyone in the loop on project status. Transparency ensures everyone knows how work is progressing and can anticipate next steps. 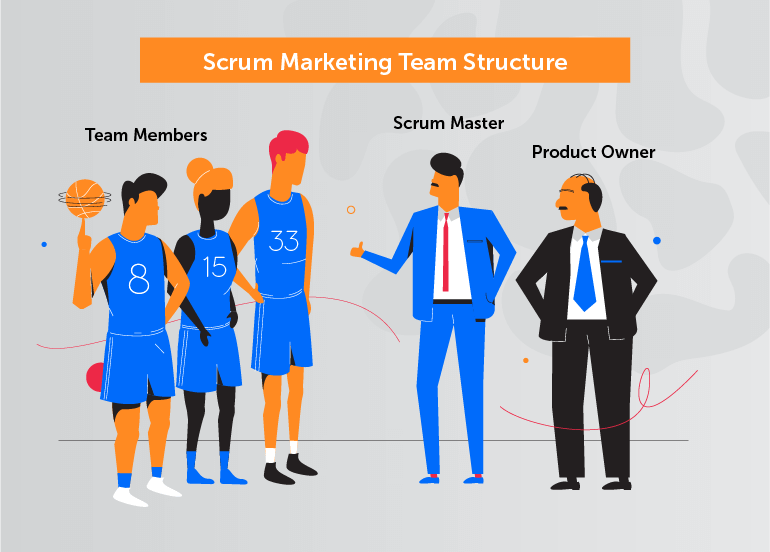 How Does Scrum Work for Agile Marketing Teams? Now that you understand the general philosophy behind scrum and the verbiage involved, it’s time to take a look at how it functions in the real world. This section will walk through the entire process on a hypothetical marketing project from start to finish. Note that this may not be the exact process every agile marketing team, but this example is based on the actual steps used by the CoSchedule marketing team. Creative marketing departments are often full of ideas. Tons of ideas. More ideas than you know what to do with. For marketers at CoSchedule, quarterly project planning begins with a brainstorming meeting (note: this process works with any type of marketing team or projects). At a high level, this entails talking through ideas (many of which have probably been discussed before in some form, because the team is constantly throwing out ideas) and prioritizing which ones are the most likely to deliver the desired results. Tactic: It may be more appropriate to label this “campaign” or “project,” but this column is reserved for whatever it is you’ll actually do. Owner: Who on the marketing team is driving this? Goal: What outcome will this influence? Problem: What top problem will this tactic, project, or campaign solve that’s currently preventing your marketing team from attracting more customers? Story: “As a marketer, I want to [IDEA] so that we solve [TOP PROBLEM]” (complete this sentence to explain the project). Measurement: Briefly explain how the campaign, tactic, or project will be measured to prove its impact. Date Shipped: The publish or launch date for the project. Date Analyzed: When were the results of the project measured and analyzed? Actual Result: What does the data show? Retro Date: When did the team hold a sprint retrospective on this project? Next Steps: What will the team do in the future as a result of executing this project? Once again, it’s okay if this doesn’t all quite make sense yet. During the initial planning phases, the details for several different ideas will be documented in this spreadsheet. Think of this like a rough scratchpad for outlining the “why” behind the “what” for everything the team will execute. Once projects have been identified, prioritized, and selected, it’s time to plan them out into sprints. The nuts and bolts of sprint planning will be explained in a later chapter, but at a high level, it entails determining all the tasks that each team member will be responsible for on each project. It also charts out when each step will be due. A sprint backlog can be planned out in a number of different ways, including using physical Post-It notes on a wall or whiteboard. They can also be planned out in a spreadsheet or using a project management tool (CoSchedule incorporates the features necessary to do this work). Estimates on how long each step will take. This can be challenging, so it’s often best to overestimate time to build in a buffer against missing deadlines. Placing each step into the correct order. Know which steps need to be completed, and who needs to complete them, to keep the project moving. Ensuring the entire team has full visibility on upcoming sprints. Whatever method of building and planning sprints you use, make sure your tool or method can be easily accessed by the entire team. The nuts and bolts of sprint planning and execution will be covered in a later chapter. For now, this is enough to give you a theoretical idea of how they work. What did they do yesterday? Which concrete actions did they execute? What will they do today? And does their work accurately follow the sprint? Is there anything stopping them from getting their work done? And how can those blockers be removed? You may have one broadly-focused standup in the morning to discuss all your work, separate standups for each project, or a combination of the two approaches. CoSchedule helps support teams manage standups with its Team Management Dashboard. It clearly shows all the projects and tasks each member of a marketing team is working on day-to-day, providing total transparency and clarity on who is doing what. If a team member has a blocker, it’s important to remove that obstacle as quickly as possible. This will help keep the team moving along and prevent the project from going over deadline due to an unforeseen hurdle. An app or tool is down. The team member can’t work because their tools aren’t working. Team member doesn’t have access to a file or service. Another team or team member hasn’t completed their steps yet. In this case, you’ll need to determine what the issue is and determine how the work will get done on time. Ultimately, a blocker can be anything that’s preventing the team member from making progress. 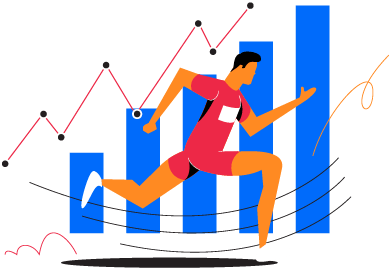 Once the sprint is complete and the project has been shipped, it’s time to look back on how the project performed, and identify lessons learned and areas for improvement. Like with daily standups, you may choose to run a retrospective for all work at the end of the week, and project-specific retros for each project you execute. This approach ensures you’re evaluating each project and campaign, as well as evaluating how things are going with your team as a whole. Was the project successful? In other words, did the sprint meet its goals? What went well? Celebrate some wins! How could it be improved for next time? Inevitably, there are bound to some things that didn’t go so well too. Think on how you can do better next time around. That summarizes the bulk of how scrum can be applied to a marketing context. Hopefully, this chapter has provided you with a useful understanding of the agile framework. 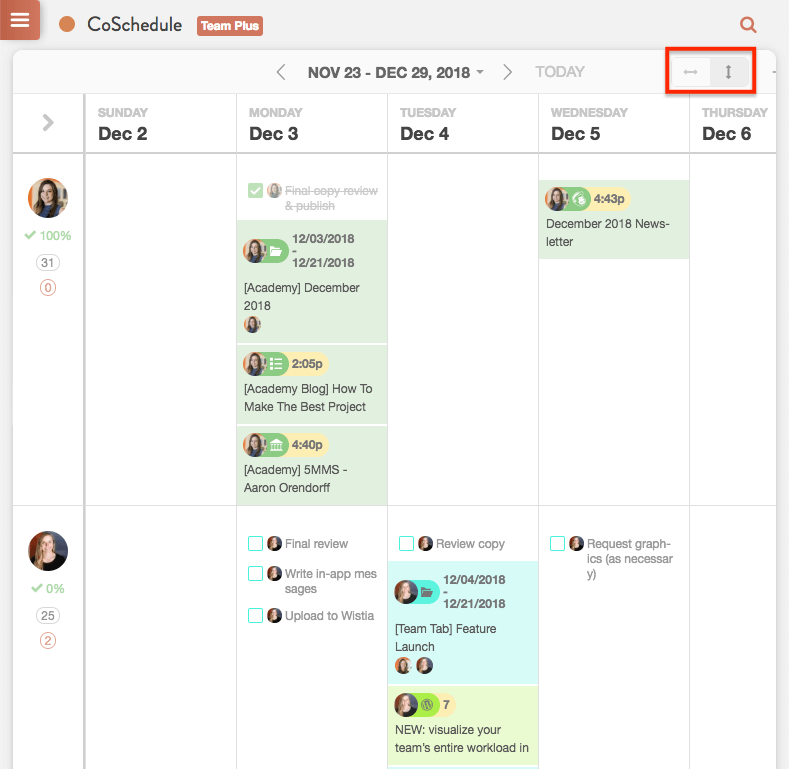 Plus, you’ve gotten a quick look at how CoSchedule can help support scrum with marketing teams. 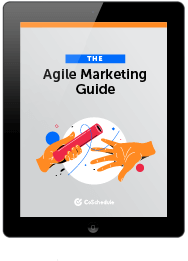 Download Your Agile Marketing Guide Bundle Now! In the meantime, get a head start on your agile marketing by starting a 14-day FREE trial of CoSchedule! In the meantime, get a head start on your agile marketing by scheduling a demo with a CoSchedule expert!